Here is an example of an effective antenna built on a budget. It is a horizontally polarized 6 element beam for 222.1 Mhz single sideband. We are going to use it for our limited rover. Credit goes to WA5VJB for his “cheap yagi” (do that exact internet search) plans that made it easy to build. Just click and drool. Get thee to a hardware store and build your own beam on a budget. Get on the 6m magic band during the second weekend of every June for the North American VHF contest, and listen for our contest rover KA5D/R. Here is an example of a rigid dipole you can build on short order, with nothing made of unobtainium, that will get you skipping across the E layer on six meters USB. Tune this for 50.125 Mhz. Each leg I eventually trimmed to 132cm, but your mileage may vary. Start long and trim equally, checking your work with an SWR analyzer. Put it on a pole and point it toward grid EM10 in central Texas…and call CQ contest. Don’t forget to turn in your log to ARRL when you’re done. Lather, rinse, and repeat every January, June, and September. Regardless of whether you like contesting, you can use this antenna to enjoy 6 meters all year round. 73! – 2003 Honda VFR800 with Yaesu FT-60R radio and Comet HP-32FHN antenna. Both installations use the Sena SR-10 bluetooth hub and a Schuberth C3 Pro helmet with the SRC communications system in the collar. The result is fantastic audio and a relatively safe, ergonomic use of ham radio on two wheels. On Memorial Day Weekend 2015, we packed Der Funkwagen for a family trip to the highest mountain in Texas…Guadalupe Peak at 8,749 feet, inside the Guadalupe Mountains National Park. The weather was perfect in the West Texas desert, in contrast to the disastrous weather that pummeled Austin that weekend. While Guadalupe Peak isn’t very high compared to other mountains in the U.S., the ascent is 3,000 feet over 8.5 miles round trip, and you should be in pretty good shape to attempt it. It is not technically difficult, but it will require exertion and endurance. Give yourself 8 hours to complete it. Having done it before with snow on the ground, I was relieved when the forecast called for perfect temps and no precipitation. Once at the top, we reveled in the views before setting up our stations. The HF station did not work so well for us. We think the antenna was not far enough above the ground. At that elevation, there is insufficient vegetation to hang wire well, and we didn’t want to lug heavy masts. The wire was strung about 5 to 8 feet off the ground at best. The VHF station worked well. We were able to make contacts using 5 watts to the Big Bend area and the Permian Basin area, over 150 miles away. I enjoyed a few QSOs before we packed up and headed to base camp. We made note of opportunities for improvement in the HF station for the future. 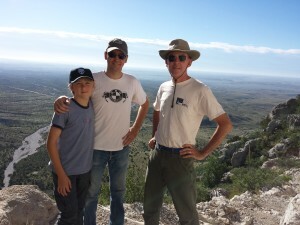 The next day we hiked into McKittrick Canyon and visited the Pratt House. The view from the back porch is fantastic. This is a much easier hike along the desert floor. Later that day we departed for Balmorhea State Park. In a part of the world where water is scarce, this park boasts the largest spring-fed pool in the world. Nothing is so refreshing as to plunge off the high dive into cool water after hiking in the desert. The campsite was spacious and we enjoyed our last night of the trip there before heading back to Austin. By the time we got to Fredericksburg, the weather turned ominous. From that point onward, we were driving in the middle of what we later would learn was an historic storm. Verily they were white knuckle conditions while Kourt was driving. As a passenger, I stared down over passing bridges into rivers swollen beyond their banks and roiling with muddy torrents. The NOAA weather broadcast blared flash flood and tornado warnings continually as we pressed forth. We had the good fortune to follow an ambulance down Mopac, using its lights as a beacon through the blinding downpour. We got on the Austin ham weather net and called in flooded road conditions as we encountered them. Shoal Creek was flooding over Anderson Lane as we carefully crossed through it. We safely arrived at the QTH to find homes with rivers of water pouring down driveways from backyards. My son and I had to make a siphon to drain a small lake from under our house. The next day, people wondered how I got a sun tan. The June VHF contest makes me excited with the possibilities. 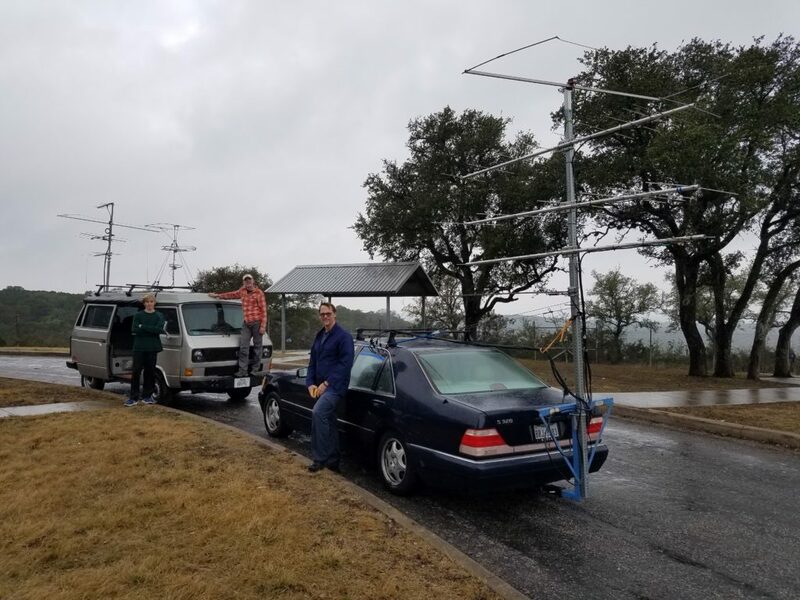 Anything can happen with the right propagation.We learned this during last year’s June VHF contest, when a generous six meter band opening enabled us to win the Western Gulf Division championship in the Limited Rover class. Here are some highlights from that contest. We learned a lot from it and and made ready. The weekend started with a trip from Austin to the Dallas area Friday afternoon to check out the new HRO and attend Ham-Com. Our plan was ambitious: to cover eight grids in 30 hours. Plenty of time was spent researching the right stop-and-shoot locations and the quickest path between them along a swath of land that extends from Fort Worth to San Antonio. Five of them were places we’d never visited but knew they were spacious, public, and high elevation. Not knowing where the evening would take us, we made sure that each location could serve as a sleepover site if needed. Kourt provisioned Der Funkwagen well with food in the fridge, water in the tank, and beer in the growler. I piled in the amps, mast, antennas, and a credit card for gas, and we were off. Saturday morning we attended Ham-Com early in the morning, then took off for our first stop-and-shoot in EM12, a hilltop roadside park. Six meters was not quite open yet, but we got a couple of non-Texas contacts before cutting bait for an even higher hilltop roadside park in EM02. There we were able to reach both DFW and Austin, and we started contacting stations from the Upper Midwest as well on six meters. To keep on our schedule of four grids per day, we decided to tear down and keep moving south. EM02 bore enough fruit to be interesting. 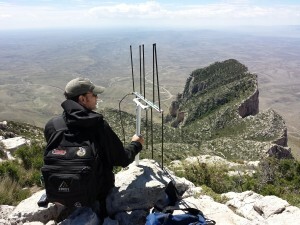 A long run-and-gun on six meters brought several more contacts on our roof-mount halo antenna. It became part of our strategy: When the band really opened, we’d tear down and move on, because we didn’t need to rely on the beam as much for propagation, when the run-and-gun halo was sufficient. Stop-and-shoot became the strategy for picking up multi-band contacts in Texas. While our run-and-gun 2M loop had poor receive due to a high noise floor from van RFI, our trusty dual-band Elk Antenna worked well for stop-and-shoot QSOs, the furthest of which was 230 miles on 2 meters. We arrived at a scenic hilltop roadside park in EM01, set up and checked in more contacts from the Upper Midwest. We were getting close to our home turf, but it was also dinnertime and the activity ebbed, so we took it as our cue to eat as well. Six meters continued to perform well on our halo Saturday night as we worked our way south to EM11, where our stop was a hilltop park tucked away in a neighborhood. One nearby curious homeowner was monitoring our nocturnal activity through binoculars as we burst out of the van like the SWAT team in the Blues Brothers, raised our tilt-over mast like it was the flag at Iwo Jima, and irradiated everything around us with the mating call of our voice keyer crooning through the Moxon beam. It was an operation that Kourt and I honed to high efficiency, so that even in the dark we were a blur of activity. As more contacts checked in from the Upper Midwest and we edged closer to our home turf and its familiar participants, each grid yielded more than the last. Finally we rolled into Lago Vista at 1am and set up one more time before bedding down for the night. We found a secret hideaway that afforded tons of privacy and space. The rain began to fall and we slept comfortably under the van’s pop top. Eating breakfast and contesting in Der Funkwagen – click for animation! Early Sunday morning, we arose and set about searching for familiar callsigns in our home grid EM10. Immediately the band lit up with people we knew, big stations booming in as we lorded over the highest point in the grid. Kourt cooked the best omelette ever with prosciutto and seasoned goat cheese while I alternately made a QSO and shoveled a bite into my mouth. The hotline we had established to the Upper Midwest was long gone, but the local contacts more than made up for it. EM10 yielded more than any grid yet. Each one was better than the last. We took the opportunity to roll through Austin in light Sunday morning traffic while our friends waited for us to get to the next grid, EL09. While there, we made the decision to run-and-gun all the way through and keep moving to EL19 where one of our favorite stop awaited in Devil’s Backbone. It was then that six meters opened up once again to QSOs in the Midwest, and combined with all our local contacts, it was the most fruitful of all the grids. We even had a Canadian contact. At this heavily visited hilltop roadside park, plenty of curious tourists stopped to ask us questions. Kourt handled tourist crowd control while I continued to rack up the contacts. The six meter band got deathly quiet suddenly, and with most of the local contacts handled, we departed for our final stop-and-shoot in EM00. Bridge outages wrought by Blanco River destruction posed a minor inconvenience to arriving at our appointed stop. It was the highest point on the whole trip, but six meters remained quiet and we made some local contacts before an approaching storm invited us to skedaddle for Austin. As we sped through the rain, I continued to call in six hoping for one more contact to put us over 15,000 points. 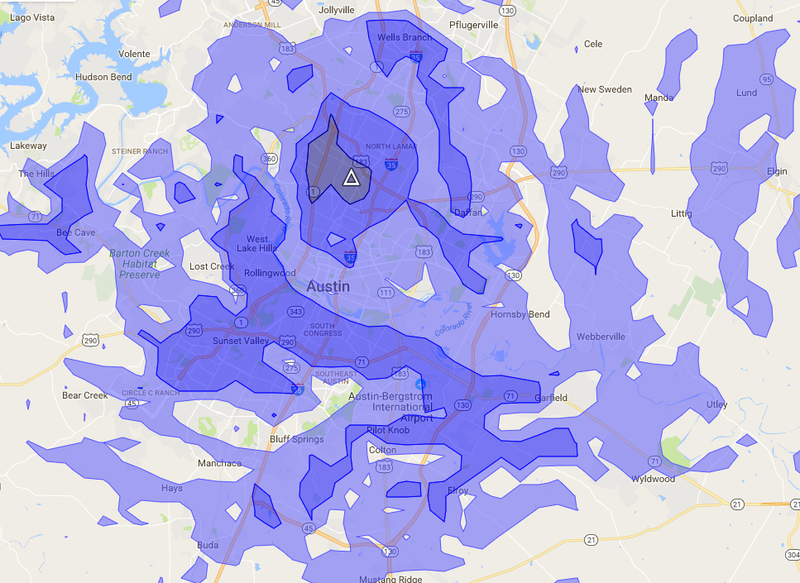 In Austin city limits a distant call came back from a rover in Montana, and with that we inched over the goal and gleefully rolled through the torrential rain back to the QTH. 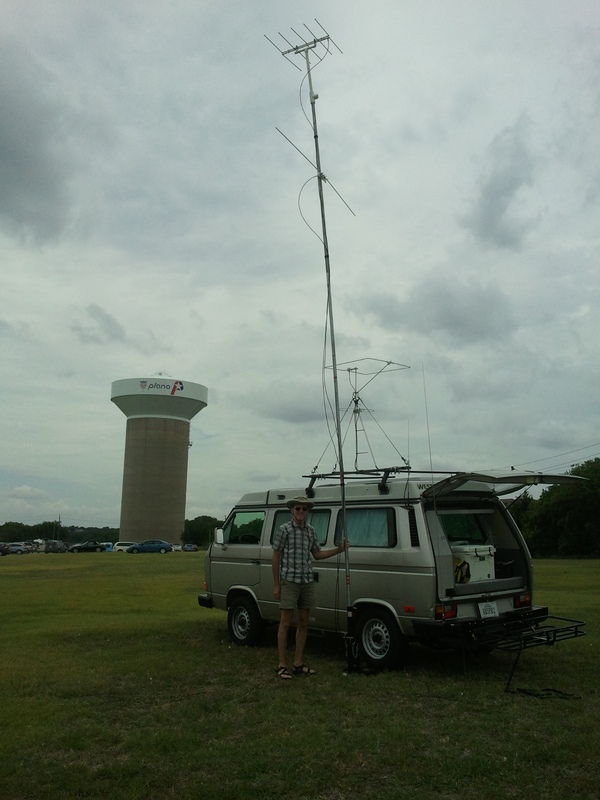 Thanks much to all the VHF weak signal enthusiasts in Texas and beyond for another fun weekend adventure. 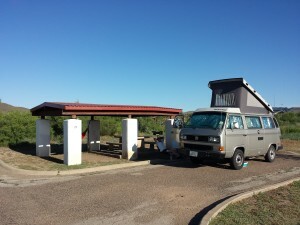 Do you want to try roving in Texas? We’ll make it easy for you. Here is a Google Maps link to all the places we stopped on this trip. Almost all of them are accessible high altitude public roadside parks with scenic views and a few amenities. We’d love to see more rovers out there. So I level the playing field by sharing the results of our experience and extensive topographic research as a challenge to bring your “A” game. I encourage others to do the same. Sharing makes the hobby better. If you have a knack for radios and like scenery, driving, camping and the challenge of operating with constraints, you’ll have a good time roving. 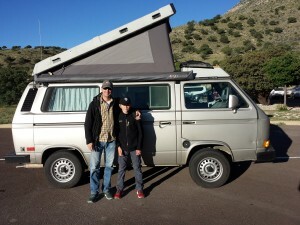 The vehicle is a 1991 Volkswagen Westfalia camper van owned and heavily modded by Kourt, including a retrofitted Ford Focus engine. Gotta get up those hills. Operators are brothers Kyle KD5EUO and Kourt KB5PRZ, fueled by PB&J, salami, omelettes, chicken soup, and 512 Pecan Porter. 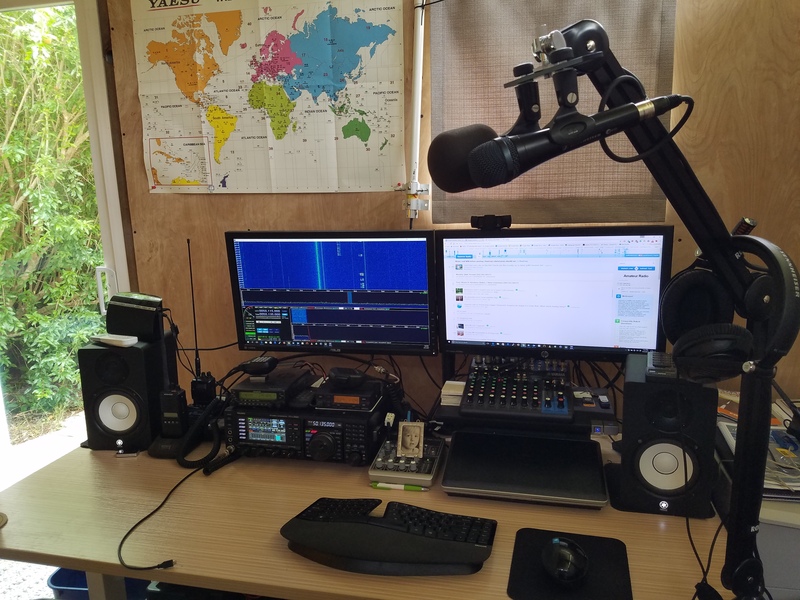 This year we’re very prepared for the June 2015 VHF contest, with better routes, better stops, and some antenna and software upgrades. We’re operating limited rover class on 6m, 2m, and 70cm. 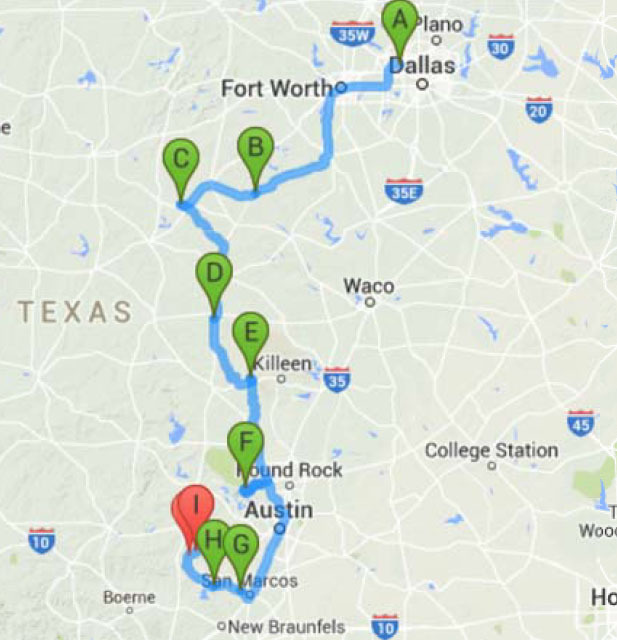 We’re going to start at Ham-Com in Irving TX Saturday and cover 8 grid squares between there and San Marcos…north of Austin on Saturday, and south of Austin on Sunday. We appreciate all the VHF contesters with whom we’ve contacted in the past, and we look forward to talking with you all on the air this weekend. 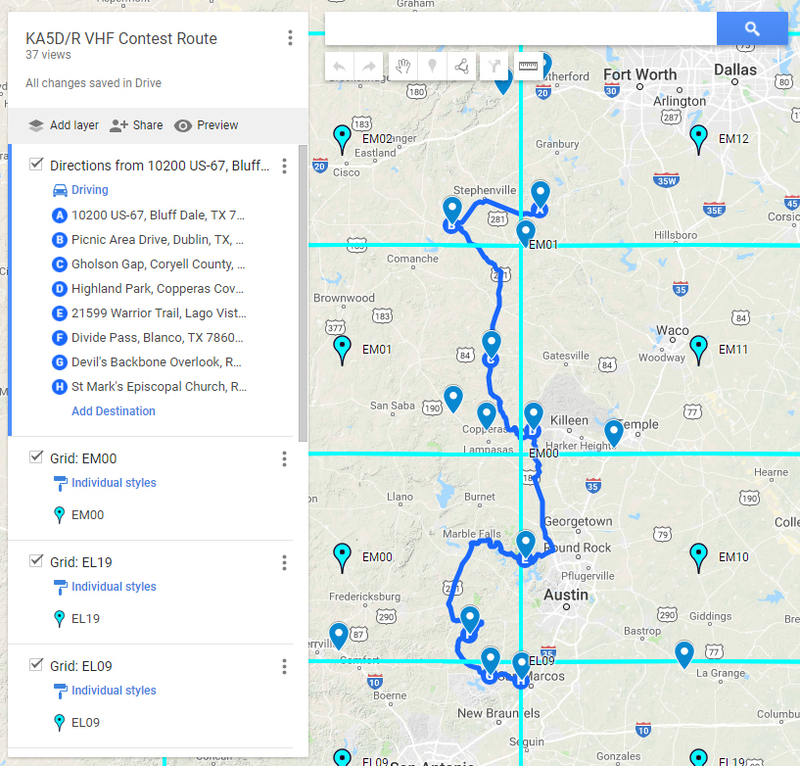 Below is our intended route, and some pics of the contest vehicle, dubbed “Der Funkwagen.” Follow us real time on contest day using our online APRS tracker, accessible from KD5EUO.com/rover. May propagation ever be in your favor! 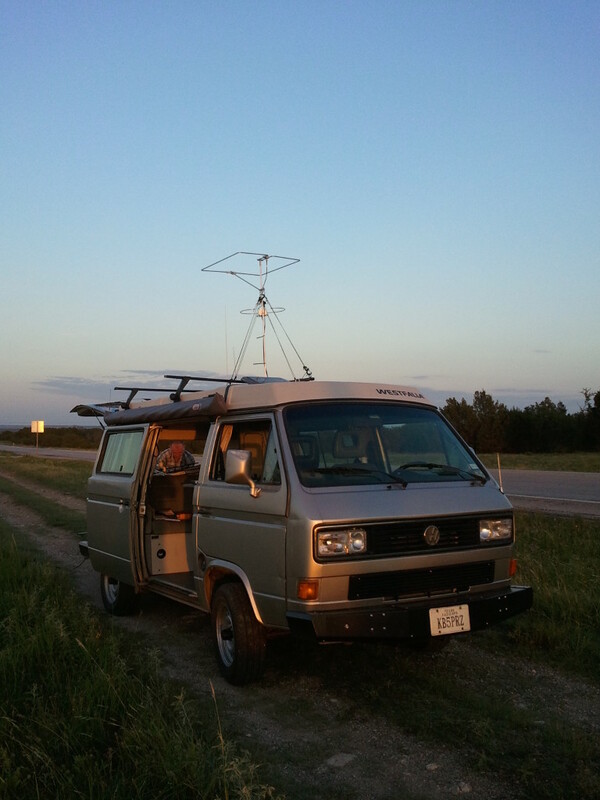 During VHF contests, we operate a “Limited Rover” class station throughout Texas from a VW Westfalia dubbed “Der Funkwagen.” You can track our position using this link. Look for us and call for us on 6m, 2m, and 70cm amateur bands.